Coffee is no longer just coffee. It has become the life force of so many people that to go without it would be blasphemy. Take a look around you on your way to work and what do you see? Daily commuters with a mug in hand, a new Starbucks sign showing off their new leprechaun latte as part of their ongoing mythical series. You may even encounter pop-ups on your media feed on why coffee will save lives or how it’s killing you from the inside. Coffee has come a long way from being a mere commodity. It’s become a staple food item in the common household to a reverent symbol of everyday functionality. You’ll see new trends in coffee or changes in habits concerning the drink. You’ll even see some new health development or speculations surrounding coffee. It’s come a long way and it’s ever-changing so we thought we’d update you on the latest news on where coffee stands in 2019. No, not the psychedelic kind of mushrooms. We’re talking about actual powdered medicinal mushrooms. We didn’t really hear about this latest trend until the last few years when it started to pick up some momentum. So what is mushroom coffee? It’s pretty much exactly as it sounds: regular black coffee with added mushrooms. Said mushrooms go through a liquefying process to turn them into a soluble powder form. Four Sigmatic, a Finnish company, is most known for their brand of mushroom coffee. They offer different product lines that claim to offer a variety of health benefits. From increased productivity to boosting energy to maintaining focus. They even offer different mushroom varieties containing Reishi, Cordyceps, lion’s mane and Chaga. All exhibiting their respective medicinal properties. Mushrooms have been used in traditional Chinese and Japanese cultures for their health benefits. Yet, can we attribute these supposed health benefits to a scientific factor? If you’ve read our past blog posting on How to Optimize Your Office for Healthy Habits, you’ll know that it comes with its ups and downsides. We’ll mention them again because we think this drink deserves a shining feature one more time. Bulletproof coffee has been catching on for a few years now, and the trend is only growing more mainstream. It’s garnered high popularity among coffee enthusiasts and religious coffee connoisseurs. Essentially it’s a mixture of quality brewed coffee, grass-fed butter, and MCT oils. It’s akin to Tibetan butter tea called po cha and is thought to have been the inspiration for bulletproof coffee. It’s said to improve metabolism and promote weight loss. However, it can also lead to an increase in overall cholesterol levels and an insufficient nutrient to calorie ratio. So cold brew isn’t exactly a trend, it’s been around for quite a while. Rumor has it that it originated from Japan, France, the Dutch and so on. But we want to focus on where we see cold brew in the future, not where it came from. What we can consider a trend is the many types of cold brew coffee and services that are out on the market right now. For those who are new to the specialty coffee scene, cold brew is different from traditional coffee brewing methods. As opposed to brewing in hot water, coffee is ‘brewed’ in cold water for a longer period to extract more of its caffeine, sugar, and oils. This reduces the coffee’s acidity and bitterness so you’re left with a smooth and sweeter finish. Expect to see a lot more in the cold brew coffee sector this year. You’ll start to see more bottled cold brew in stores, and a variety of cold brew styles in shops as well. Emerging services range from serving cold brew on tap to cold brew delivery services for the office. Suffice to say, cold brew is only growing more mainstream by the year. Speaking of cold brew, Nitro cold brew is like the second cousin to plain old cold brew. Except for this time we infuse cold brew with Nitrogen. It sounds pretty potent like it’s supposed to give you some sort of super strength or ability. But all it really does is create a creamy, sweeter and smoother finish thanks to the nitrogen bubbles. Services for Nitro cold brew have become more mainstream as well, making it easier to find in coffee shops and to provide in local offices. You can look forward to finding a range of services now from office coffee delivery to Nitro on tap at local shops. People rely on coffee so much to keep them going during work hours, why not mix it into happy hour too? Rumored to be the next big thing, coffee cocktails are the result of adventurous consumers seeking new thrills for their taste buds. A report done by The Future Laboratory details 4 people, and thus 4 reasons, that have made coffee cocktails a thing. The first being that the coffee cocktail trend arose from a generation of tech-savvy folks who desire a visually appealing drink. Then we have the people who are known as optimizers. They aren’t afraid to play around with the favorable qualities of coffee to get the most out of their drinks. You also have the people who are willing to try something new no matter how outlandish it may seem for the sake of adventure. Lastly, you have the people who like to experiment with taste and flavor combinations that bring out the best qualities in a drink. This trend may have a lot to do with the desires of different folk, but with the same desire: to find the next big thing in coffee. Take your cold brew in one hand, and take your soda in the other. Put them together and now you have a sparkling cold brew! This drink is by far the easiest to perfect at home, without having to scramble to the nearest coffee shop to get it. This can be a hit or miss with some people, either making it the perfect summer drink or chaos in a cup. And the fizzy concoctions don’t stop there. Top off the drink with a bit of citrus and you’ve got yourself a nice refreshing cocktail of fizz, caffeine, and fruity aromas. Without so much as a backward glance at the progress it’s made, coffee is leaving other beverages hanging in 2019. ‘Coffee like you’ve never tasted’ is the tagline for these new and ongoing trends that have people talking. And the buzz is not only about the newest drink out there, but about what coffee brings to the table. Going back to our earlier claim, trends in coffee are more than just coffee. Coffee culture has embraced a desire for newness, quality, and experimentation. New trends in coffee mean new trends in habits, more styles, and better options. Whether it’s optimizing the time of day you drink your coffee to finding the best style of coffee that brings out your favorite aromas. Even to find the best way to find your next caffeine fix, there’s a way to optimize that too. Coffee services for the office are on the rise and gaining massive popularity. 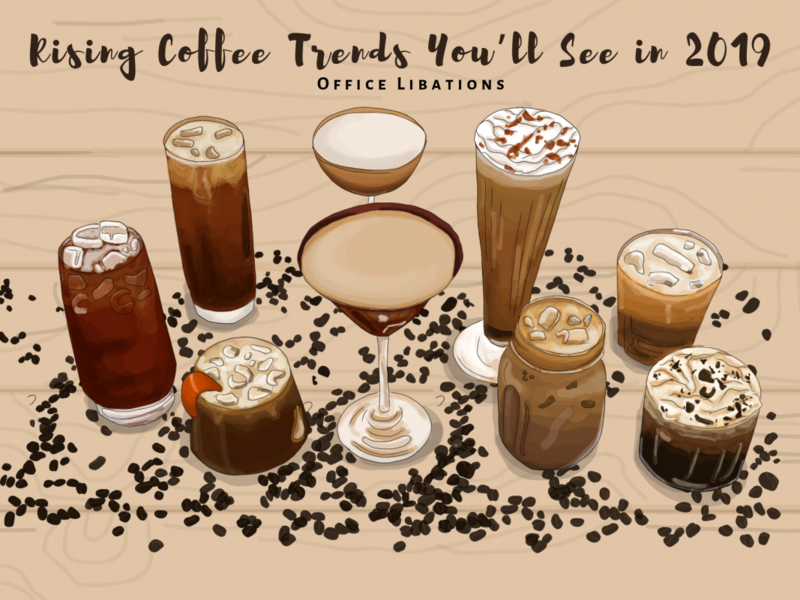 Get the most out of your coffee cup, take a look at some other rising trends and find what works best for you.